Interesting. I recently upgraded to the next beta and I probably didn't flush the cached scripts afterward. I'll have to keep that in mind. I'm 24 years old and former nursing and kinesiology student who lives in Ontario, Canada. I was unable to finish my studies because of migraines and extreme eyestrain. My main area of interest is pharmacology and human physiology. I have always been a huge gamer. I experienced mild eyestrain in my early teens from CRT monitors. It was mitigated by increasing the "refresh rate" from 60 to 85Hz. When I did experience eyestrain, it dissipated with a night's rest. When LCD monitors hit the market, I was an early adopter. My eyestrain dissipated completely and I was symptom free for many years. Fast forward to 2011. I had not used a monitor extensively for a couple of years because of bad repetitive strain injury's caused by excessive gaming. In this way I missed using a monitor extensively until a few years after LED-backlit monitors hit the market. When I found good treatment for my RSI I was able to return to computer use and bought a Lenovo T410s. This was the beginning of my problems. At first my eyes had some resiliency. Looking back, the screen was never as comfortable to use as my old CCFL-backlit monitors, but I endured. At some point I started getting very dry, strained eyes. This is where my fatal mistake began. I was very devoted to school at this time and I chose to push through my studies regardless. The effects were devastating. I ended up with sharp pain in the corners of my eyes, spasm of the ciliary muscles (spasm of accommodation), headaches, migraines, and intensely dry eyes. Since that semester I have been exquisitely sensitive to light. Eco-friendly store lighting triggers all of my symptoms, and all but a select few monitors are pure hell to use. Currently I can use an old CCFL-backlit monitor and a monitor from BenQ's flicker-free line for a limited amount of time. My family purchased a Panasonic ST60, a plasma TV, and at first it seemed promising. It too now gives me eyestrain quickly. When I bought a couple of years ago an iPad3 I noticed that I'd get instant nausea and eye strain + headaches when looking at it. And then the same happened when I bought an iPhone 4s. It then still took me a while to figure out that this was not something particular to those devices -- since I can remember I'd put the screen brightness as low as possible. I always had nausea / headaches problems but I erroneously had attributed them to other causes, and only at that moment everything became clear. It is also now clear to me that my problem is not specific to computers. I also seem to hate white light and fluorescent / LED lights. But I also have issues with natural (sun, candle, etc) light. Playing "fast" games such as Quake or Unreal Tournament always gave me headaches, as my eyes would get fuzzy and confused over fast movements. I hate with passion those new movies with high FPS. They make me dizzy. I was diagnosed with a very mild astigmatism. I've tried using glasses for a month but they actually only made matters worse. Keeping a regular eating schedule does seem to ameliorate my migraine problems. I don't know very well what to do atm, as new devices are being built with LED which is absolutely terrible. I miss my old laptop with CCFL, it was really easier on the eyes when set at low brightness. This is highly problematic in my field as offices are full of fluorescent / LED lighting + multiple LED screens. It's dreadful. Hi i am a 19 years old university student from Germany. I always was a little bit sensitive to artificial light and when my family changed from an old CRT TV to an LED TV some years ago my eyes were lightly strained for a month or so but the effect went away after some time and i forgot about it. My problems started after using a MBPr for a month in the end of 2014. It started with irritated and dry eyes first, followed by heavy nausea and temporal visual defect as soon as looking for some seconds on the screen of the Macbook. I had to sell my Macbook and go back to my old Windows laptop. Since then i have a problem with screens in general and my eyes are often very dry. I have a very light astigmatism that was diagnosed by a optician after the problems began but the glasses that i wear since then only have a light effect on the problem and even GUNNAR glasses did not help that much. The eye doctor only diagnosed dry eyes. The only devices that i am able to use without any effect on my eyes are android devices. The developer options allow to turn the hw-overlays off which worked for me. Like most of you guys i fear that there will be more and more "bad" LED lights and screens in the future. Artis It's interesting to hear that you seemed to have less of a problem with CRT's vs LED backlit devices. When I was little I had an expensive CRT that could do 120hz and a first generation CCFL backlit Dell monitor. I got no headaches from flickering lights when I was little but I can remember far back as when I was 2 years old I could see 60hz flicker from LED lights that are unfiltered from line power frequency. Well Artis it seems that we are qutite similar people. I have also "dry eyes" and a slight astigmatism in my right eye. Also I was very sensitive to laserpointer and microscopes etc. Which hardware overlays do you mean exactly with android? I also don't think that PWM is your problem. Sorry for answering late i forgot to check the welcome thread. Yeah i also think that pmw is not the problem because during my student job in a tv studio i have to work with three pc screens and they are all the same model from EIZO. Two screens give me only slight strain but one of them (which shows a livestream and is not connected to my desktop pc) strains my eyes very badly and gives me a headache. So it seems that the input source is my problem. You go into the developer options and check "disable hadware overlays". For over a year I have experienced a range of medical problems related to my exposure to all new light bulbs. My symptoms include strong headaches/migraines and severe eye pain with sensations akin to cutting or strong pressure. Unfortunately consistent exposure to LED has left me vulnerable to other forms of lighting such as CFL and Halogen which I no longer find tolerable. It could simply be a cumulative impact of exposure to hostile lighting for several years but I can longer use a smart phone (previously I used an iphone, Blackberry etc without any problems) or any other LED based devices. At present, I only feel comfortable using (the now phased out) incandescent lighting and I think the roll-out of LED was the catalyst for my decline as I was definitely able to handle Halogen (still available on the market) before LED became commonplace. Increasingly I am encountering these LED bulbs in most homes and businesses. As the bulbs are now widely used and as my reaction to these bulbs is extremely severe, I am faced with clear limitations on my daily activities. For example the overhead lights in most shops cause me to experience some of the above symptoms within seconds. There are numerous places I avoid altogether due to the eye pain caused by the presence of these new bulbs. At work all co-workers are now using LED monitors and many parts of the office use LED lighting. Unfortunately this makes it very difficult for me to work and I am reaching crisis point as I am working in an environment with almost intolerable lighting. As well as this forum there are various groups of people across the world complaining about light sensitivity. Are most of you only prone to pain from LED backlight devices or do you also suffer from LED street lights and home lighting as well? Hallo from Scotland! Very glad to find this forum! I had absolutely no problems with my eyes until I purchased a Macbook Pro in January 2012. I began to get headaches almost every day which often developed into intense migraines with swirling nausea. I refused to believe it was the laptop that was to blame for far too long, changing my diet, getting eyes tested etc, all the while my eyes became more and more photosensitive to the point that being in sunlight hurt. I then believed that it was LED technology that was to blame, and since I had to use Macbooks every day for work (teaching music production) I set about speaking to Apple about it. They were great and replaced the internal screen in my laptop several times as there are different brands of LED screens in each Macbook. None of this worked unfortunately. Fast forward to now and through years of testing I've narrowed down that my primary problem is temporal dithering (although I'm also less sensitive to PWM). I am now able to comfortably use a screen for 12 hours a day, with my current systems being desktop PCs with an Nvidia graphics card (currently GTX560 & GT610) and an LCD monitor. I've yet to find a laptop that I can use! I tried with ATi / AMD graphics cards but since they have dithering on by default they give me the same symptoms as OSX does with ANY configuration (OSX also has temporal dithering enabled across the board). What LCD monitor are you now using without pain and does it contain CCFL backlight or LED? Are you adversely affected by LED room lighting or just the monitors? APC75 Thanks APC75. I'm currently running CCFL LCD monitors for all 3 setups - these were actually purchased prior to realising that LED backlighting itself wasn't necessarily to blame in my case so I haven't tested with LED monitors yet - I'm going with 'if it isn't broke, don't fix it' for now. The monitors I'm currently using are EDIT: Viewsonic 2855 and Benq v2400w, both of which cause no problems with the Windows / Nvidia setup but will cause big problems if used as an external monitor with my Macbook since temporal dithering is applied for external monitors as well as a Macbook's internal screen. I recently installed LED room lighting in a studio with no noticable negative effects, although I had to find warm, yellow tinted bulbs as I find most LED lighting to be very harsh and blue. My eyes have always been sensitive to blue light as well - this combination of temporal dithering, PWM and blue light makes it very hard to narrow down what's causing the main problem but in my case it's definitely TD. si_edgey It's interesting to see that people have sensitivity to different things. 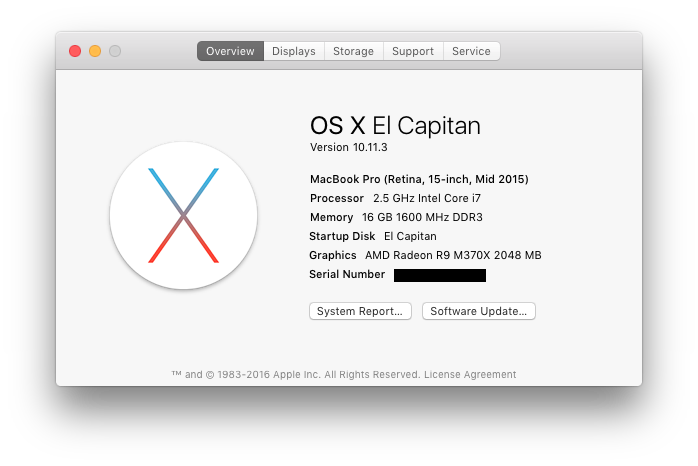 For example I have a 2015 Macbook Pro with Intel/AMD switchable graphics and can use it just fine for >10 hours per day. First time I've been able to use a computer that long in years. But give me a laptop with PWM and I'll be having a headache in seconds. My father's work laptop (HP Elitebook) has Intel Broadwell integrated graphics with some sort of IPS screen built in (but no PWM) and I am able to use it just fine.